Kelseal Rubber Mouldings is a specialist commercial moulding manufacturer supplying to various industries throughout Australia. 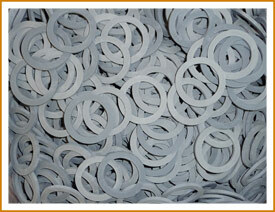 Unfortunately we do not do small non commercial runs of less than 1000 on washers, seals or rings. 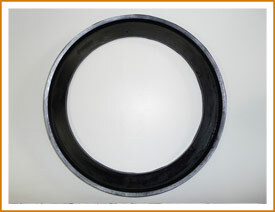 In its most basic form, a seal is a ring captured in a groove and is designed to control fluid leakage in reciprocating, oscillating, or rotary motion applications. From this basic function you can derive a multitude of applications, such as seals for rods and pistons, wipers to prevent ingress of foreign matter, or protection devices such as buffer seals. 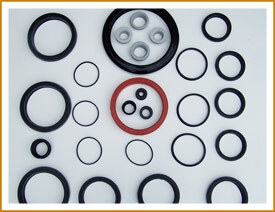 Common materials used to make seals can be natural rubber, nitrile, neoprene, silicone and viton. Typically, the material type is determined by the specific operating conditions or limits due to pressure, fluid chemical compatibility or temperature. It should be noted that the Food and Drug Administration does not actually approve any rubber compounds. Rather it publishes a list of permissible ingredients and the maximum allowable concentration of each. Antizonants, Plasticizers, Fillers, Colours, Lubricants, Emulsifiers, and Miscellaneous. It is the responsibility of the manufacturer, or the compound supplier, to ensure that FDA compounds are formulated according to these guidelines, and are cured under conditions of good manufacturing practice. Unless otherwise specified, all compounds are black in colour and sulphur cured. • The rod seal acts as a dynamic seal along its inner diameter, and static along its outer diameter. • It is directly affected by changes to the rod surface and fluid temperature fluctuations. • Often sees the highest pressure variations or spikes in the system. Depending on the level pressure range of the system and the fluid compatibility, Kelseal Rubber Mouldings offers several different options of rod seals. Wear rings are resilient, wear resistant thermoplastic bearings designed to go inside hydraulic applications to support, guide, or reduce the friction between the rod and the cylinder body. 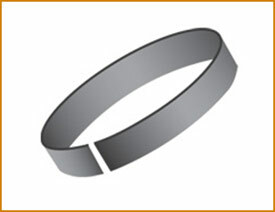 These wear rings are especially important in applications where heavy side loadings are unavoidable. For example, a heavy side loading over time can cause normal rod bearings to become oval shaped. This oval shaped rod bearing could then cause poor seal performance as the clearance between the rod shaft and the rod seal becomes larger due to wear. This distortion can lead to excessive fluid leakage, deformation of the rod seals, seal extrusion, and eventually seal blow out.